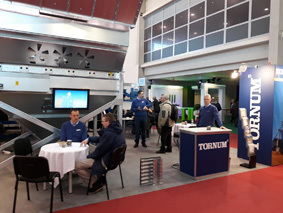 The 10 years old company Tornum Kft exhibited at AGROmashEXPO in Budapest in January. 350 exhibitors participated in the 40.000.m2 area. The exhibition had a record number of 46.500 visitors . The Tornum’s stand was always full with visitors. Both new, and a lot of existing contact, visted us. On top of the event we agreed to deliver an HR3-12 Heat recovery dryer to a customer this summer.